I know everybody is busy this time of year. This easy , easy french bread pizza could be a quick lunch or dinner. It also used a lot of peppers and tomatoes that I had from this weeks haul. I just diced the veggies & tossed those with my leftover asparagus from last night. I added alot of minced garlic too. I layered some marinara sauce, veggies and fresh mozzerella on a loaf of french bread that I cut in half. 12 min at 400 degrees on a pizza stone. Probably healthier then takeout or store bought and just as satisfying. This entry was posted in Dinner, Lunch on September 19, 2011 by andrewsbeth. I love French bread pizzas! Tom makes these all the time…very good! I love that too! 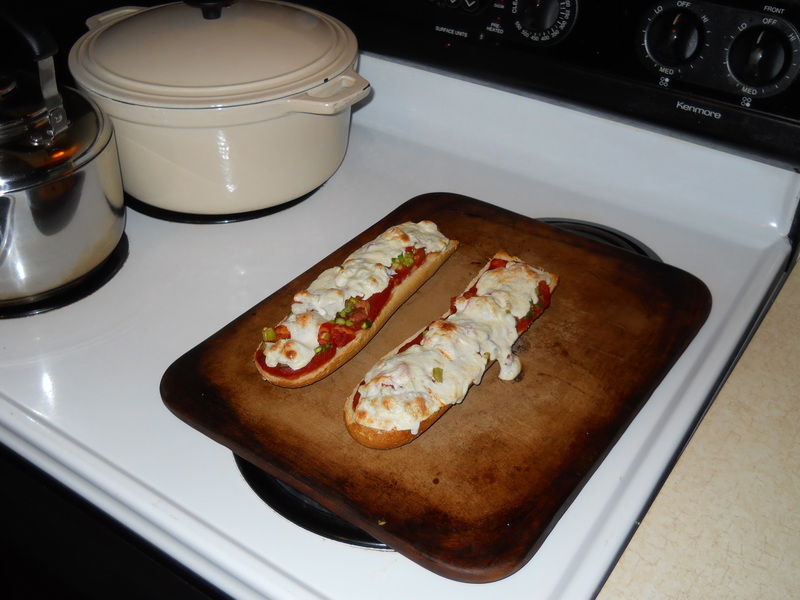 I always buy those pizza crusts when I am so busy, but I used to love French bread pizzas, so I will do that again. Thanks for the tip!